If you’ve been jailbreaking for a fair amount of time, then you’ll be more than familiar with Substrate Safe Mode. It’s designed to help your device remain usable when conflicts arise, allowing you to resolve the issue and remove the problematic package(s) or extensions with as little incident as possible. It’s not the most welcome of situations, since it only arises when there’s a crash of some description, but it is a necessity in helping your device to recover, and with Substrate Safe Mode having just been updated in Cydia, this is one package you’ll want to download and install at the soonest opportunity. There are occasions when a tweak hasn’t been properly refined before release and a user is forced to boot their iPhone, iPad or iPod touch into safe mode, but in my own experience, such crashes only tend to occur when a multitude of tweaks are installed and running at any one time. Like the App Store, Cydia is a library of temptation, but whereas, storage space permitting, you can install as many apps from the App Store as you like, you’re running a bit of a risk if you go on a downloading frenzy with files that go right to the core of iOS. 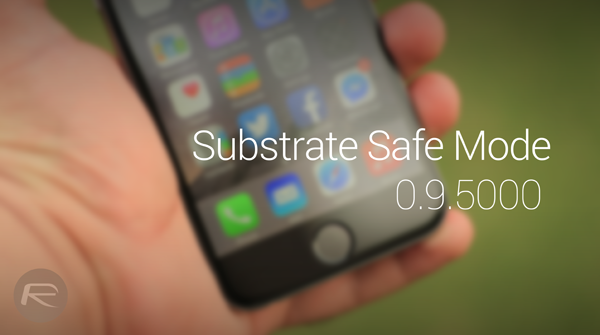 Substrate Safe Mode 0.9.5000 has just been rolled out to the masses, and as per the release notes, is even safer on iOS 8 and 8.1 running devices jailbroken using Pangu8. It’ll likely be bundled into the next Cydia update, along all of Cydia’s other dependencies and associated workhorses, but for the time being, grab the new Substrate Safe Mode package via Cydia. As of version 0.9.5000 this package is even safe on iOS 8.0 (and 8.1, too!). It’s important to note that this update won’t gobble up your battery like previous versions, as the release notes state that it won’t use 100% CPU whilst you’re on the device’s SpringBoard. Downloading Substrate Safe Mode is as easy as pie. Simply launch Cydia, hit the refresh button in Changes, and the update should pop right up. Simply update, and then reboot your device for the changes to take effect. Substrate Safe Mode is just like safe mode on desktop, which boots up the device using minimum – and absolutely necessary – resources so you can troubleshoot matters and make things as they should be. And if you’re a jailbroken user, then there’s no way you should skip on Substrate Safe Mode. Now if I could just figure out why I can no longer download for the Apple App Store, nor connect/sync with my computer. Some tweak done me wrong!